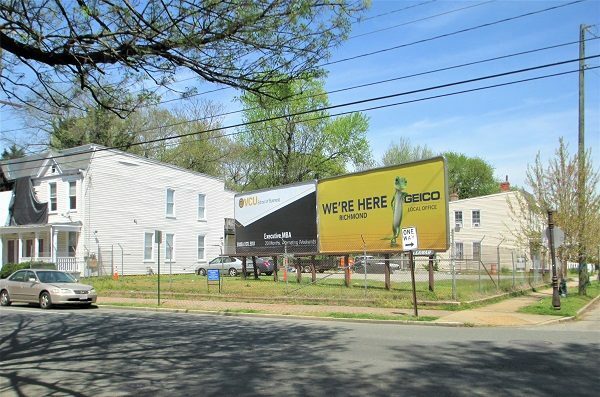 An entity tied to Scott’s Addition-based contractor Daniel & Co. is planning a cluster of 18 new modern-design townhomes on about a half-acre of mostly vacant land at the northwest corner of Cary and Shields Avenue. The project would replace two existing structures and also could involve another dwelling at 10 S. Shields Ave. alongside an alley. The entity, called CaryShields Mews LLC, is applying for a special-use permit to allow for the project, which is on the consent agenda for the Richmond Planning Commission’s meeting Monday. Plans submitted to the city show three-story buildings with units totaling about 2,000 square feet each. Johannas Design Group is the architect. The designs appear comparable to the A2 townhomes that Dallan Development tucked between two alleys within a block near Cary Street Station. Those homes, another modern-style infill, were designed by 510 Architects. The CaryShields homes would be built on vacant land currently occupied by a billboard and replace existing two-story homes at 2202-2208 W. Cary St., some of which appear to be in poor condition. One structure closest to the corner looks to have sustained fire damage. According to the plans and an overview of the project submitted to the city by consultant Lory Markham, the project may involve rehabbing or replacing the home at 10 S. Shields Ave., though Markham said Thursday that has yet to be decided. An occupied home at 12 S. Shields Ave., between that home and the vacant corner, is not included in the project. The SUP would waive the lot size and public street frontage required for single-family homes in the existing zoning, R-63 Multifamily Urban Residential District. The homes would be served by 19 off-street parking spaces, with eight units equipped with rear garages. Eleven additional spaces would fill a rear parking lot accessible from a proposed driveway and/or the alley off Shields. The view from South Shields Avenue. Nine of the homes would front Cary Street, while nine others would front an interior landscaped courtyard, according to the plans. About half of the units would have roof terraces. Daniel & Co. would be the contractor on the project, which is estimated to total $5 million in construction costs. Pending permit approval, CEO Sam Daniel said construction is projected to start this fall and wrap up by spring 2020. Daniel said the homes would be priced at market rate, with pre-sales starting in September. Property records show LLCs tied to Daniel & Co. purchased the properties over a span of seven years. The larger corner lot was purchased in 2005 for $400,000; 2206 and 2208 W. Cary St. were purchased in 2006 for $320,000 and $174,000, respectively; and 10 S. Shields Ave. was purchased in 2012 for $180,000. Combined, the properties most recently were valued in a city assessment at $1.27 million. City planning staff is recommending approval of the project, which the commission could endorse without discussion Monday. Cases included on consent agendas are typically approved en masse unless a commission member requests discussion. The Uptown Civic Association submitted a letter supporting the project. Meanwhile, another corner infill project is taking shape a block east at Cary and Rowland streets. Cory Weiner of CW Performance Group is developing a two- and three-story mixed-use building there, across the street from another newer development that houses sandwich shop Olio. 4 Comments on "Billboards to make way for townhomes on Fan corner lot"
It’s a good thing to see empty lots develop, especially if the new homes are for-sale housing. We need more of them in the City. I don’t always like the modern art architecture but I’m old! Let’s build the City! I think the frontage is a reference to the minimums per building, which these have no chance of meeting. ie say 20 feet of width on street per building. By recollection and without checking, setback is different. That said, I support minimum setbacks in the city, it helps make it more urban. Front yards are for the suburbs. Technically this property isn’t in the Fan, so it doesn’t infringe on the Fan style of 20th turn of the century homes.